The Ruffwear Trail Runner™ System enhances miles on the trail by providing a hands-free hip belt and leash system that allows easy access and carrying of essentials. 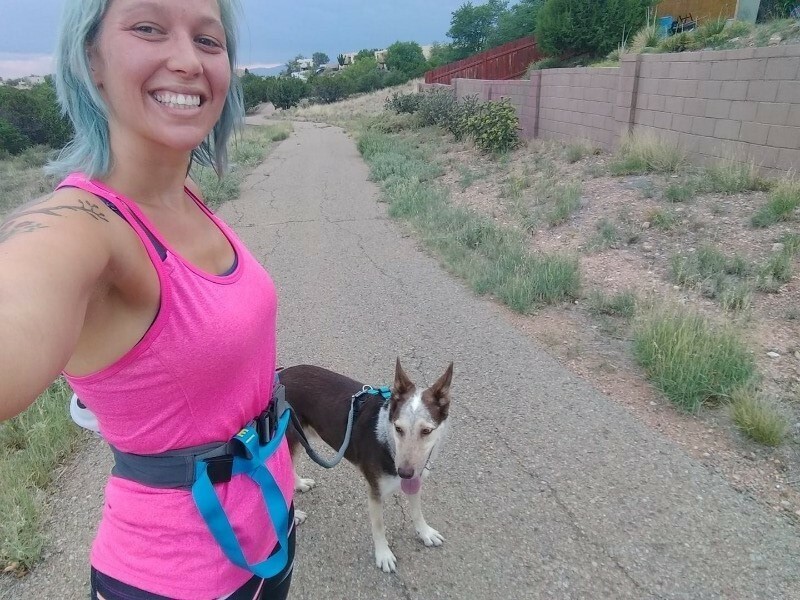 The Trail Runner™ Belt offers humans a comfortable, bounce-free, load-dispersing design with an intuitive leash attachment release for quick disconnect when needed. The belt includes a zippered, water-resistant pocket, a stretch mesh pocket, and an included 21 ounce, BPA-free Ruffwear water bottle that fits securely in a holster on the back. While the belt is compatible with any leash, this system includes our shock-absorbing Ridgeline™ Leash, designed at a length that’s optimised for running or walking. Trail Runner System is a good safety system. Since I have arthritis in my hands this Trail Runner System gives me peace of mind in case my hands can't hold the leash as in the past. Even though we are just walking or taking my girl along my scooter when we can it is a very good product. Can't be too careful and dropping the leash would not be good. Awesome product with 1 flaw! We got the trail runner system so we could go running, jogging and hiking with our dog! I hate holding his leash while working out and this was the perfect solution. The belt is great and comes with a variety of pockets so you can bring water, keys, phone and treats. I like how it has a quick release tab for the leash, we have used it a few times already. The only reason I don’t give this product 5 starts is because the bungee leash wore out after the second use. Our 30lbs dog isn’t a huge puller during a run, but will have tension on the leash from time to time. I expect a Ruffwear product to be of higher quality/durability. They were however great in providing a partial refund so we could purchase a bungee leash elsewhere. We still use the belt A LOT!!! Highly recommend!! Comfortable, easy to use, I love mine! I love my running belt! The bungee leash might be a little long for me for busy trails but I usually run with my dog away from the crowds anyways, and the bungee gives him that extra space and slack to enjoy his run. I wear it tight and high up on my waist and it doesn't do any shifting, riding up, or spinning around. It's easy to use, comfortable, and I highly recommend it. 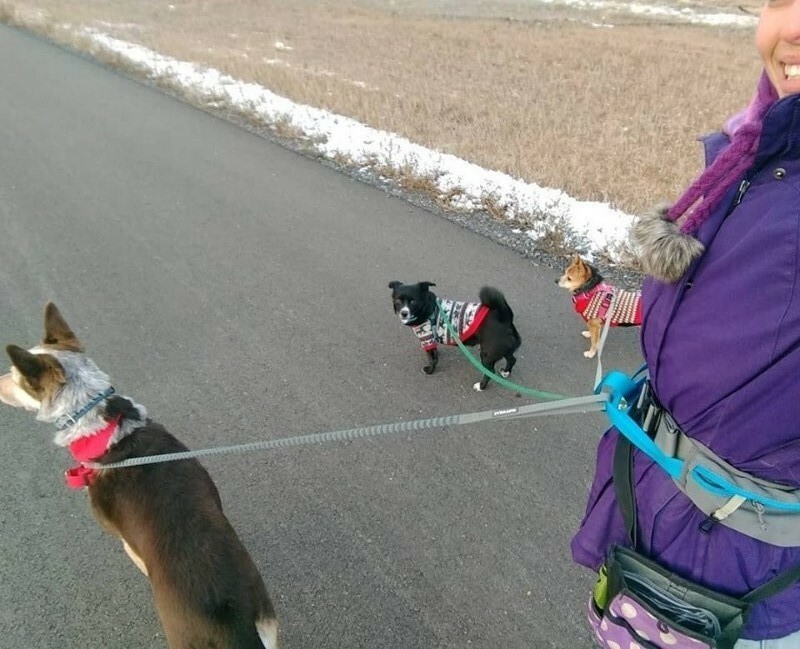 I also use it for walks when I have all three of my dogs. With my littles I use handheld leashes, and for my big dog I use this belt. I absolutely love the trail runner system! With a standard leash, my husky will pull because I can't keep up with his natural walking pace without speed walking (I'm pretty short). Since we started using the trail runner system, I can keep up with his pace easier since he has more stretch on the leash and I'm not killing my arm trying to rein him in. It would be awesome if the leash had a traffic handle for control when needed, but otherwise the system has been a godsend. I love the waist harness, but the elasticized leash is too flimsy.